Over the past few years Grand Haven, Michigan brewery has gone from a curiosity to me to one of my most favorite Mitten State beer makers ever. For instance, their Citra Pale Ale is one of the most perfect of the kind ever and every other thing they've done that I've tried from their regular rotation stuff like Bean Flicker and so on have been great too. With that being said, it's no surprise that their specialty, occasional and seasonal brews rock my socks in quite away too. Their sour series has been way top notch and everything that they've barrel aged has been done way more that awesome too. Their Granny's Apple Pie rolls out about once or twice a year and it is one that always makes it way to our fridge and onto our taste buds every time. 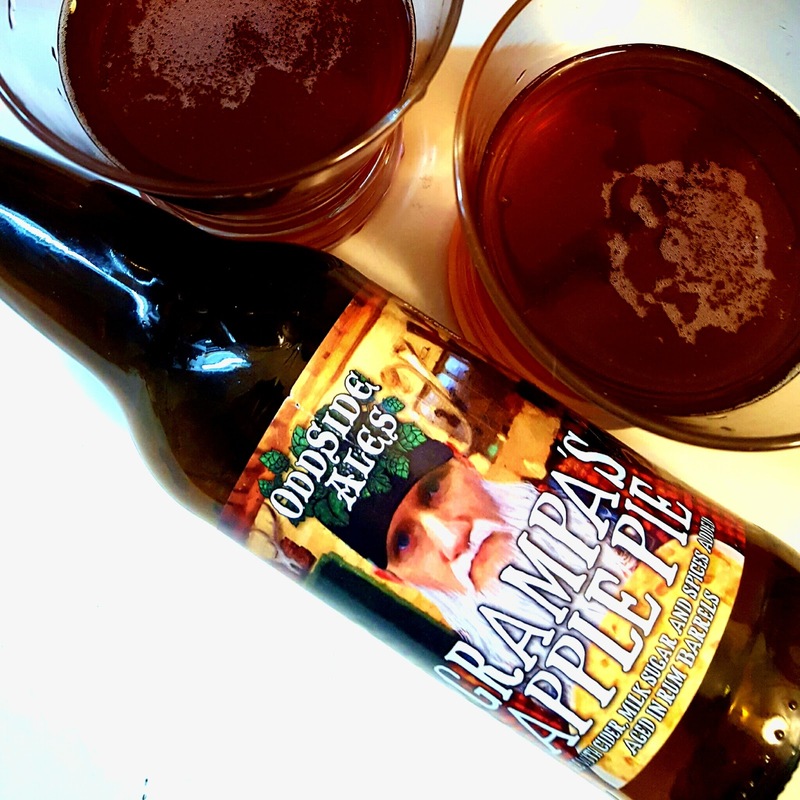 It's one of those beers where a person says "It really does taste like apple pie" without exaggeration or hyperbole. What was missing from it? Nothing. Along comes grandpa though with an idea on how to turn it up a notch anyway. By taking the recipe and letting it sit a while in a rum barrel let me tell ya, Hoo-Boy! Does it ever get a kick in the behind. Pouring a little darker amber in color that Granny's is the first sign that this is going to be a little more about being a bit more rustic and burly. The head is minimal so there's no waiting around for that frilly stuff to go away before the sipping starts. The aroma is like hanging out at the apple orchard and heading straight to where they make the cider so you can breathe in the air. The tart, the tang and the cinnamon that's sprinkled over the doughnuts that are being baked just around the corner are all represented. All these are represented just as much in the flavor too. Cider forward for sure, but the spices do just what they're supposed to do without too much or too little of any of them. The barrel aging brings out an oaky & vanilla rum soaked thing, giving it a richness and taking a kick to another level. The milk sugars become more pronounced in the end, which gives the finish something like have a little dollop of ice cream. And what goes better with apple pie than that right? A lot of people will tell you that the best way to have apple pie is freshly warm from the oven. Beer is best served at a cooler temperature but don't worry, a few sips of this and you'll feel warm all over.